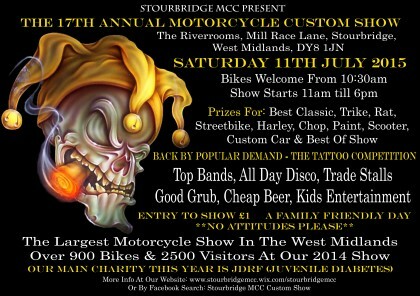 On Saturday 11th of July, Lee and the team will be supporting SMCC with their 17th annual custom show. It’s a fun filled day for all the family, including the fantastic chance to have a close up look at a large variety of customised cars and bikes, entertainment for the kids, trade stalls to look around, plenty of food and drink to keep you going, and listen to live music throughout the day. Lee’s 2015 race winning Formula Jedi will be on display at the show, this is a brilliant opportunity to get up close to a race machine that can go from 0-60 in under 3 seconds. Entry to the show is only £1 and is on all day from 10am till 6pm. Kids will have the chance to have their pictures taken in the race car and we will be running a raffle to have the chance to win some great prizes. The money we raise will be split half and half between the supported charity for diabetes and helping Lee stay on track during the present season. It’s going to be a great day so come blow off some steam and support the event.